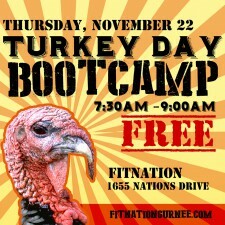 Join us on Thanksgiving morning for FREE Turkey Day Bootcamp! Out of town family and friends welcome! Must be 16 and over. All participants will need to sign in at the front desk before class. There is a maximum of 75 participants for class, so please come early to ensure your spot!